When watching True Detective, it's clear that writer/creator Nic Pizzolatto is pulling inspiration from a number of source materials to formulate his vision of a desolate Louisiana noir. When viewing any of the earliest episodes, one can note the influence of Raymond Chandler, Terrence Malick, Elmore Leonard and Cormac McCarthy. It's a heady-brew of "southern fried" crime that incorporates some surprising philosophical elements. But I couldn't quite shake the idea that there might be another influence or two at play from something even a little closer to my heart. 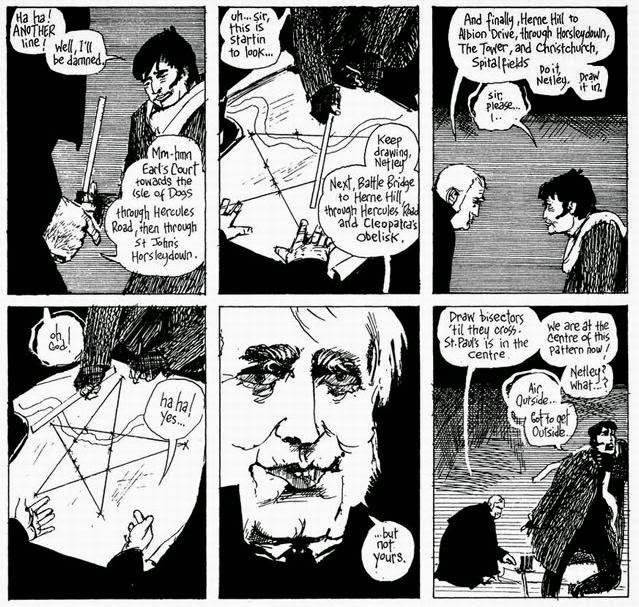 In the first few episodes, I could gather a fairly strong Alan Moore-like slant in the dialogue and the general approach to the mystery, namely from his ground-breaking meditation on the Jack The Ripper mystery From Hell. Beyond just the superficial similarities of a killer that stakes out his victims as a part of a greater calling and occasionally communes with "old gods", there's a stretch of the book dedicated to the discussion of philosophy. 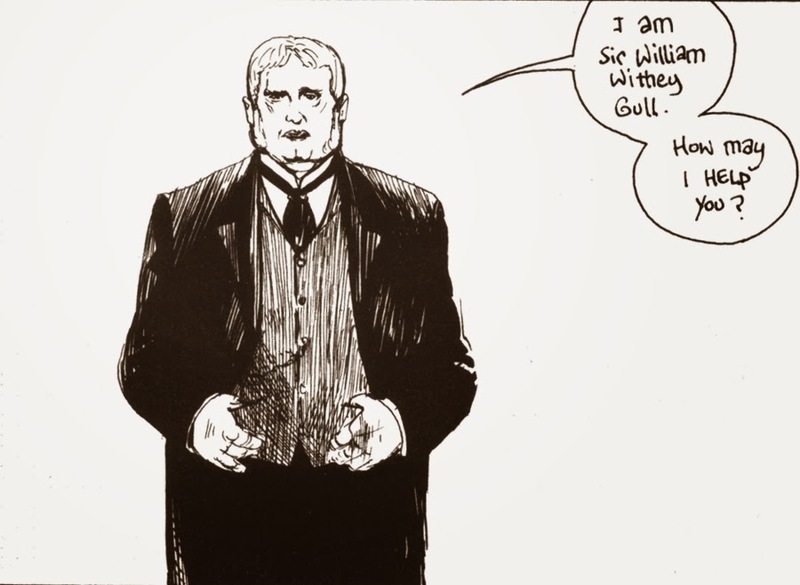 It was rare to find this kind of combination of pot-boiler with a deeper delving of varying forms of philosophical world-views, so when Cole began to expound upon his own beliefs about the human condition, I suddenly started to think "I bet Pizzalatto has read Alan Moore". Then the Fifth Episode: "The Secret Fate of All Life" aired, and I found myself blown back by the clear influence of, if not directly, the same ideas that inspired the comic writers that I would consider some of the best that the medium has to offer. Additionally, it may be possible that some of these points of influence could provide viewers with a sneak peek of what's to come in True Detective's final episodes. 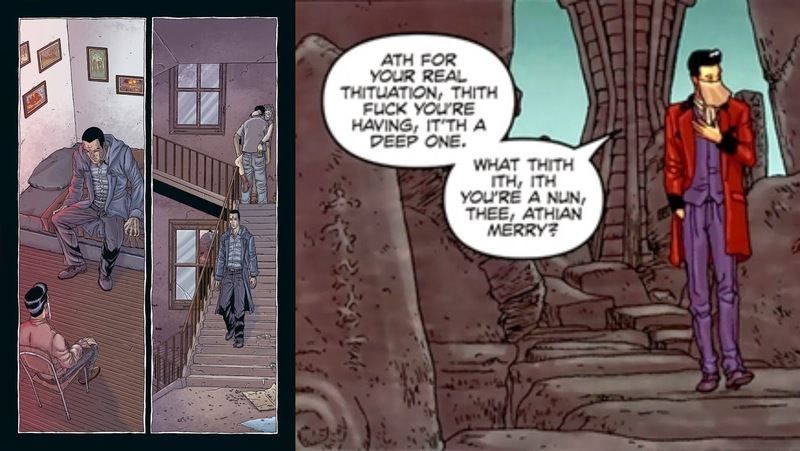 From a purely plot driven angle, it's hard to deny that Alan Moore's The Courtyard may be where we find some of the biggest echoes to the story Pizzolatto is crafting. In Alan Moore's 1994 story, a prose tale later adapted into a comic in 2003, we meet Detective Aldo Sax. Sax is an FBI agent specializing in "anomaly theory", wherein he collates seemingly unrelated data into a specified whole. Sax's strange methods cast him as an outsider within the rest of the Bureau, but his methods prove effective. The main thrust of The Courtyard details Sax's attempts to investigate three seemingly unrelated murders across the US. This eventually leads him to a young man who deals a drug called "Aklo", the after-effects of which are shockingly similar to the reported actions of the three different murderers. After Sax meets with this dealer, he quickly learns that "Aklo" isn't a drug at all, but a language. When the dealer speaks it to him, it drives him mad, thrusting him on a crash-course tour of the various realms of Lovecraftian mythos. These visions eventually drive Sax to murder his neighbor in the exact same fashion as the crimes he was investigating. Does this at all sound familiar? In terms of how flashback Cohle and his modern day form both appear, it's easy to draw parallels between the characterization and the psychological path that both Cohle and Sax took. While we don't still know why Cohle appears so disheveled now, we also don't know how he transformed from a skeptic to a seeming believer in the more esoteric ideas that his suspects were spouting off. It's hard to argue that Pizzolatto's tale is going to head in the same direction as Moore's story. But there are similarities between Cohle and Aldo, initial high functioning intellect/low social skills protagonists who are driven to some form of mental impairment/self-destruction. And it's possible The Courtyard provided some basis of inspiration, though I highly doubt we'll be seeing True Detective veer into the realm of the fantastic. Another tie-in worth mentioning: The drug dealer who ends up driving Sax mad is named Johnny Carcosa. This tidbit is relevant, as Carcosa is the name of an ancient and cursed place that appears in Robert W. Chambers' book The King in Yellow. This is the very same text that inspired consistent mentions throughout the show about The Yellow King, which Reggie LeDoux and his cohorts were obsessed with, along with the story of Carcosa itself. 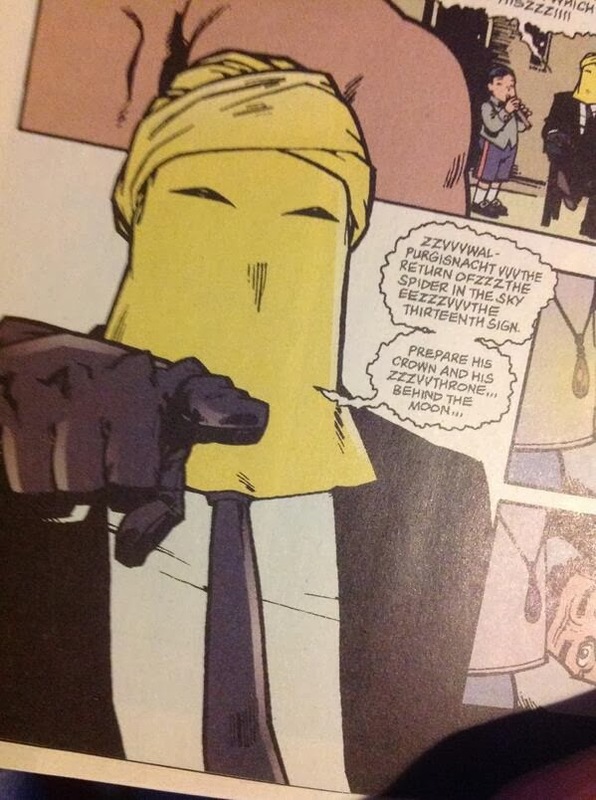 Did I mention that Johnny Carcosa also wears a yellow veil? io9 recently detailed the connections between True Detective and Chambers' text, but Moore, much like Pizzalatto, imbued these mythos with procedural elements and may have provided a pathway for True Detective to follow. Trigger warning: Moore followed up The Courtyard with a sequel entitled Neonomicon, and the titles are sold together. I can only safely recommend The Courtyard to those curious about its connections to the ideas present in True Detective. Much of Neonomicon is drenched in extreme sexual and violent imagery. During "The Secret Fate of all Life", Cohle made mention of "M-Theory" and began to describe the concept to his two inquisitors. Immediately, I knew that sounded familiar, as what he began to describe was very similar to a concept I learned about through Grant Morrison's The Invisibles. In simple terms, the theory works thusly: while time is linear for us as three-dimensional beings, beings of a higher dimension would see us as two-dimensional and would be able to view our past and future at the same time, not unlike looking at a map or flipping the pages of a comic book. Cohle's describes what we see as a sphere, which appears as a flat circle to those beings that are beyond us. It's a heady concept that's been floating around cosmological circles since 1983 (and perhaps earlier), and while its multiversal antecedents have existed in science fiction for decades via string theory, the theory itself (to this extent) rarely appeared in pop culture other than in Morrison's watershed series. 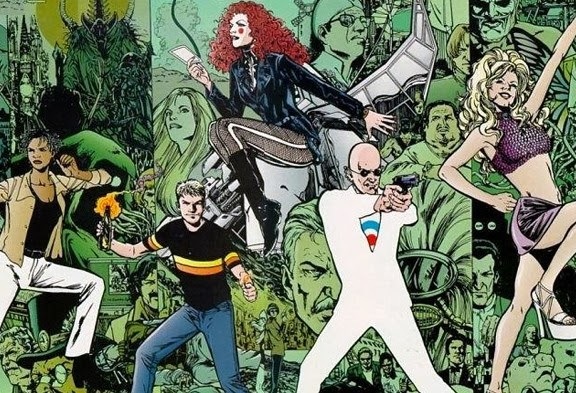 The Invisibles' plot follows a single cell of The Invisible College, a secret organization battling against physical and psychic oppression using time travel, magic, meditation, and physical violence. A central focal point of the series is that time, like in M-theory, exists all at once. So, for example, the adult version of one character is able to commune with his past self and influence his own future. 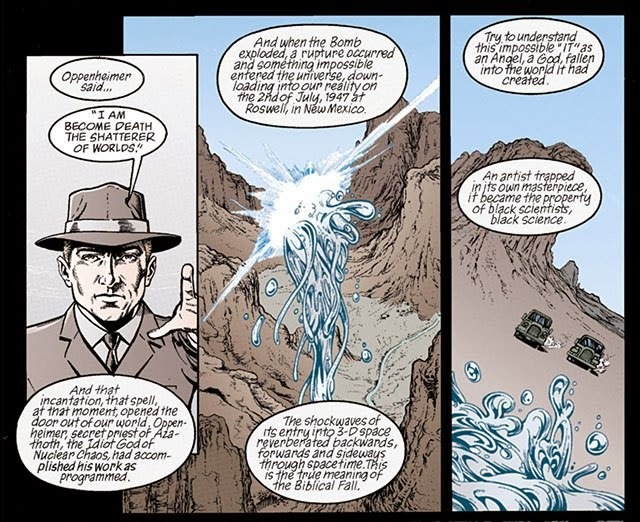 Or perhaps, an even more pertinent example, when Robert Oppenheimer tests the atomic bomb in Roswell, New Mexico; this action opens a tear in reality that brings a higher dimensional being into the plane in which our characters reside, creating a ripple effect through the past and future that develops the central conflict on which the series is based. The Archons, the antagonists of this series, are fairly similar in appearance to the kind of Old Gods that appear in Lovecraftian fiction, including the usage of Shoggoth minions (a la In the Mountains of Madness) throughout the narrative. Additionally, a certain yellow-draped King also appears in the story in a key role towards the saga's end. To that point, Morrison's opus doesn't have the same sense of plot inspiration that Moore's above work most likely holds on Pizzalatto's writing, but given the deep grasp of meta-fictional storytelling tools that Morrison employs often, he may have a firmer hold on the writer's creative process. The Daily Beast recently produced an article positing that utilizing M-theory, True Detective is actually a show about television storytelling; that we ourselves can revisit these same moments in Cohle's life over and over again, in any order we choose, as the "higher dimensional beings" that Cohle refers to. Pizzalatto is, like Morrison, attempting to go beyond just genre and make a statement about the form itself. In the end, that may be the greatest legacy that this stretch of episodes leaves for those willing to embrace such an idea. I refuse to make an argument that these are the only or even key influences that developed around True Detective as a series. 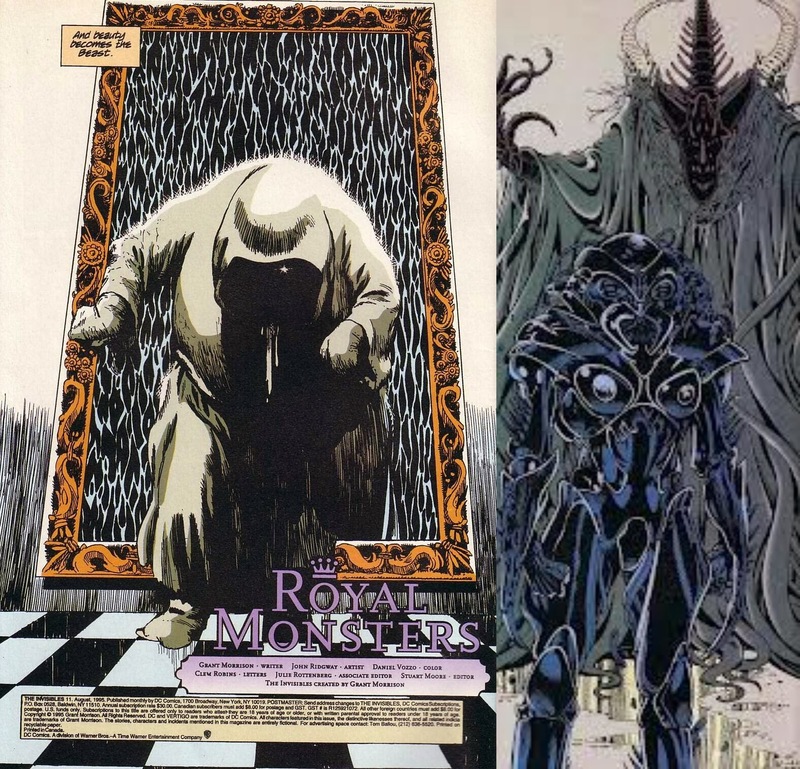 I'm rather certain that these two writers were more likely a starting point (as seen in the quote above, found after my thoughts began to formulate in this direction) that led Pizzolato "down the rabbit hole" to the King in Yellow, meta-physical theory, and many of the other philosophical concepts that inform the show's deepening mythos. But after awhile, it's hard not to see many of the ideas that Pizzalatto brings to the fore appear in other sources. 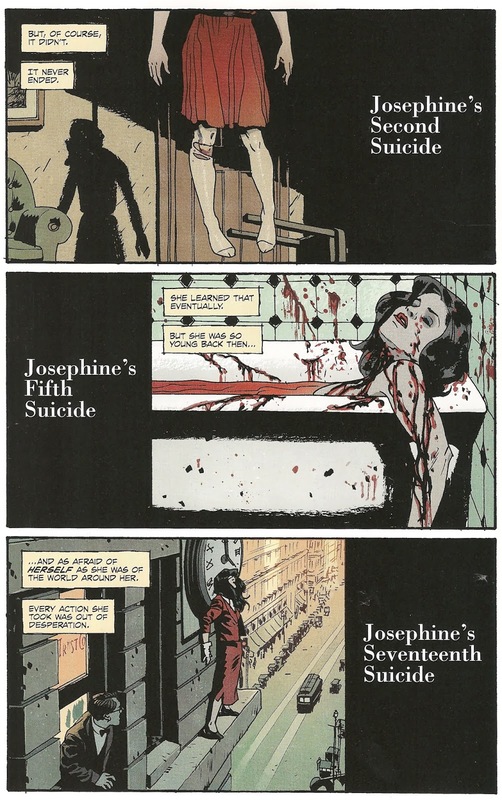 In a bizarre twist of universal fate, Ed Brubaker's critically acclaimed Lovecraftian inspired noir Fatale, made the "Eternal Return" (the Nietzsche concept that the universe is ever-repeating) a center piece of its issue 21 which happened to come out the exact same week as Episode 5 of True Detective, which also made mention of this idea throughout its script, though both had been written months in advance. And just for fun, and to really nail down this idea that Pizzolatto and these comic writers are on similar wave-lengths. "The Eternal Return" is often signified by a picture of a circular snake eating its own tail, also known as the "Ouroboros", which just happened to be the symbol that represented an organization that opposed Batman in Grant Morrison's recent run on the character (in Batman Incorporated to be precise). While it's impossible to say to what level Nic Pizzolatto finds inspiration in the work of these two comic book writers, the parallels of interest are quite compelling once you consider the two different areas in which the series attempts to aim: as a source of philosophical horror; where the Lovecraftian and Chambers mythos are a completely untapped resource for television, thusly increasing their ability to terrify, and as a product that goes beyond just a standard viewing experience to focus in on just HOW we watch television. In other words, Hannah is absolutely right, True Detective is indeed changing television, in more ways than we realize.